Ivy’s dad and I will be getting married later this year so it seems appropriate to kick off 2019 with a book about a wedding – although hopefully ours will go a little more smoothly than the one in this story! Betty O’Barley and Harry O’Hay are two scarecrows who are very much in love. When Harry proposes, Betty is overjoyed and the pair start planning the best wedding the farm has ever seen. They make a list of all the things they will need – “a dress of white feathers, a necklace of shells, lots of pink flowers, two rings and some bells” – and then set off together to gather the beloved items together. Soon they have everything except the pink flowers so Harry heads off on his own to find some whilst Betty has a little nap. However things don’t quite go to plan and Harry ends up being away for such a long time that the Farmer brings in a new scarecrow to replace him! Reginald Rake is the total opposite of Harry O’Hay. He’s selfish and showy and he isn’t nice to Betty at all. He boasts about all the things he can do but Betty isn’t impressed – she just wants her lovely Harry back. But then things take a perilous turn. Reginald Rake tries to show Betty how good he is at blowing smoke rings, but he drops his cigar and sets the field alight. Will Harry make it back in time to save his bride? 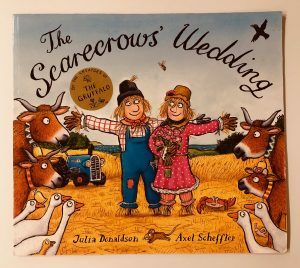 This is one of our favourites from Julia Donaldson and Axel Scheffler. There’s a lovely mix of romance and adventure and Ivy gets very excited as the story twists and turns at the end. I guess you could choose to criticise the fact that we have a girl scarecrow being rescued by a boy scarecrow – but I think that does the story a disservice. I prefer to focus on the way the story shows the difference between someone who respects women and someone who doesn’t. 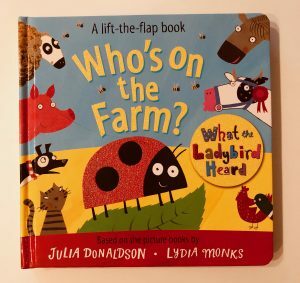 We’re big fans of ‘What The Ladybird Heard‘ by Julia Donaldson & Lydia Monks. In fact we went through a stage towards the end of last year where we read it at bedtime every night for about 2 months! The illustrations, in particular, are fantastic so we love this little spin off board book with a ‘peekaboo’ theme. The book starts by asking you who you can see on the farm. It shows you pictures from the original title and identifies the characters, but there are also lift-the-flap sections which encourage you to guess who is hiding. Little fingers can open the chicken coop to find the fat red hen, move a haystack to spot the hairy hog and find the cats behind the hedge. Look carefully and you might even spot Hefty Hugh and Lanky Len in a pile of manure!